If you feel especially minimalistic this season, these black and white nail designs are what you need to make your point until the end. Sophisticated and easy to adapt to any outfit, these designs can let people know that you like things simple and don’t have any time to waste. Black and white never disappointed anyone and if you don’t have the time to create really complicated and time consuming designs, you’re in the right place. Start with a base coat to protect your nails. With black and white polish start drawing different yet simple shapes on your nails, like v shapes or hearts. For thinner lines use a thin striping tool. Be sure to let your nails dry before applying your top coat to avoid any accidents. I do imagine this nail design working well with a minimalistic black outfit, army boots and a black hat. Apply black as a base color on some nails and white on others. Let them dry fully. This is important in order to maintain in order to not get any imperfections. With a dotting tool apply dots using the opposite color. For the lines you can use a striping brush. Finish off with a matte or shimmering topcoat and you’re ready to go. Add a light-colored ivory cocktail dress and red lipstick to let you feminine side shine. This is a really romantic and cute black and white nail designs, yet very simple. Add black as a base color and let it dry. Afterwards start drawing flowers and the corners of your nails. You’ll need some yellow polish for the center of the flowers. Add a boho long dress, let your hair fall on your shoulders, wear no makeup and go for a romantic walk. Dandelions are a delicate symbol of the fact that wishes do sometimes come true. Start with a white base coat and let it dry. With a thin nail art brush start drawing your dandelion as being blown away. You can transform it into birds that fly away to make your wish come true. Add a white tutu skirt and a simple white top and you’ll look magical and optimistic to everyone around you. Panda bears are one the cutest species that we’ve ever known, so they surely deserve a spot on our hands. Start drawing an oval shape from the middle of your nail downwards. Add the ears, nose, eyes and mouth using black polish and a nail art brush. For the final touch, use a dotting tool for the eyes. You can match black and white nail designs with a panda backpack, a cute black and white schoolgirl dress and go read your favorite fairytale in the park. Simple lines are a way to make a statement this season. You can create this look by using a thin nail art brush after your base color is completely dry. Add a white dress with a geometric print and sandals that pop out with a bright color, like yellow or magenta. Add a statement lipstick and do your hair into a tight bun. You’re ready to be a diva. If you have a special event to attend, you can create this simple gradient look using your white and black polish. Start off with a white base color and let it dry. While it dries, add liquid latex on your skin in order to clean the excess easily. On a makeup sponge add black and white polish and gently dab it on your nails until you get the desired look. You can add some glitter polish at the middle of your nail. 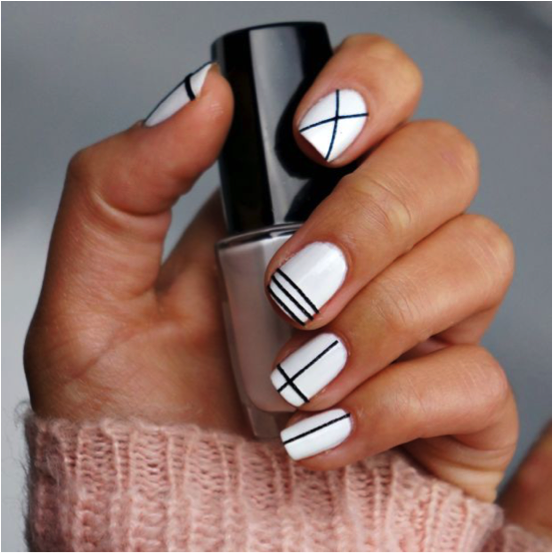 Wear your favorite long dress and feel confident with black and white nail designs. Another fashionable design is the marble design. Start with a white base color and secure your skin with liquid latex. Use white and black acrylic colors and mix them to get a light gray color. Apply on your makeup sponge and gently dab it onto your nails. Use darker shades of gray to paint your lines. Use darker gray gradually in order to get a gradient effect. Add your favorite topcoat. Now you have a simple and sophisticated nail design that looks professional. Somehow this nail design reminds me of Minnie Mouse, probably because of the polka dots and the bow. Start with a black base color. For the dots you need a dotting tool and white polish. After it dries add a matte top coat. You can apply all kind of nail gems in order to get that extra glow. Add a black dress with white polka dots and a big bow on your ponytail and you’re ready to be cute and fashionable, all in black and white. This symbol reminds us there is balance in the world. You need two matte polishes. Do each nail with any color you prefer and after they dry, draw the symbol on which nails you prefer. Simple, beautiful and easy. Maybe you can use this design to remind yourself that what goes around comes around. Wear your favorite pair of jeans and a simple white shirt and take a five minute meditation break somewhere in nature. If you’re a big fan of these kinds of designs, you should invest in some good quality polishes since you don’t need you only need these two colors. Also, be sure you have a top quality base coat and top coat. As usual, you’ll a sponge for a gradient effect and some nail gems if you want that extra sparkle. As you can see, black and white nail designs go great with so many textures and colors, the options you have are basically infinite. They look great with gold, with silver, with red or black. Adopt any kind of jewelry that you like and you’ll stand out even more.